There are few sights that compare with autumn colours along the Dempster Highway. Oranges, reds, and yellows spill upon the Oglivie and Richardson Mountains to create a landscape masterpiece only nature could paint. Evenings, free of urban smog and lights, offer incomparable views of the Aurora Borealis or Northern Lights. 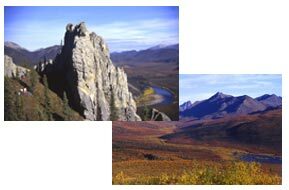 From Dawson, we will camp and drive along the gravel Dempster Highway, the only public road to cross the Arctic Circle in Canada. During our travels we pass through a section of the Yukon calledBeringia. This area was unaffected by the last great ice age thus presenting a landscape that would have been very similar to that which greeted those early migrants who used the land bridge between Alaska and Asia. A number of day hikes are planned to view flora, fauna and some of the most incredible scenery in the north. Who hasn’t imagined a secluded log cabin, nestled by a lake, in a true wilderness setting? Our tour ends with a two day stay at a rustic cabin on Lake Laberge, where you can brush up against the solemnity of the Yukon. This is the perfect location to do some fishing, canoeing, hiking, photography, or sit back and just relax. Included: Transportation from the point of origin and return, hotel in Whitehorse & Dawson City, cabin on Lake Laberge, camping fees, cooking gear, camp stoves, tents, meal preparations, tarps, major first aid supplies, meals/snacks/beverages on the expedition, emergency radio or satellite phone, and professional guides. Meals: Most meals provided. Day 1: We will begin our trip in Whitehorse. Almost immediately after leaving Whitehorse, we will turn off the Alaska Highway and head north on the Klondike Highway. The route is a mix of forests, open bush and bare hills. There are some great scenic delights along the route and we will stop to enjoy some of them. We should arrive in Dawson City in the late afternoon. Day 2: The day will be spent in Dawson City. You will be mostly on your own to allow you to focus on your own interests. We will take those who are interested to visit the original gold fields and to the top of the Dome, a hill overlooking Dawson. Day 3: In the morning we will set out for Klondike Corner and the beginning of the Dempster Highway. The highway follows the North Klondike Valley, flanked on either side by high mountains. After approximately 2 hours we will reach our campsite at the Tombstone Mountain Recreation Area. After setting up camp we will hike into Grizzly Valley, our first opportunity to see the country up close. Our high point will provide us with views of Mount Monolith – the most spectacular of the Tombstones. Day 4: As we leave the campground, the road climbs to a viewpoint of the Tombstones, then crosses its high point at North Fork Pass and levels out into sub-arctic tundra. Our short driving day will bring us to our campsite at Engineer Creek. In the afternoon, those who wish to, can join us in a hike up Sapper Hill to get a close view of the castellations (rock formations resulting from wind and frost erosion). Those who prefer to stay behind can spend the morning in more relaxing pursuits. Day 5: Our road will take us along more spectacular castellated ridges, reminiscent of the Great Wall of China. We will cross the Continental Divide again through the Ogilvie Mountains and will pass into a region untouched by glaciation. In mid-afternoon we will stop at Eagle Plains Hotel, the first community and gas station since Klondike Corner. The highway winds back and forth along a ridge that provides a spectacular view of the Ogilvies. We will reach the Arctic Circle (66.5 N) in less than an hour. Rock River Campground, our campsite, is not far from here. Day 6: We begin heading south on our return journey. From Eagle Plains, we will return to Tombstone Campground. Day 7: Leaving the Tombstones we will drive to our cabins on Lake Laberge for a relaxing close to our trip. Day 8: We will spend the day at Lake Laberge cabins. Day 9: Our last day! – hard to believe that it is here already! We will return to Whitehorse in the afternoon.